Carte Du Perou, Avec Une Partie Des Pays Qui En Sont A L'Est. 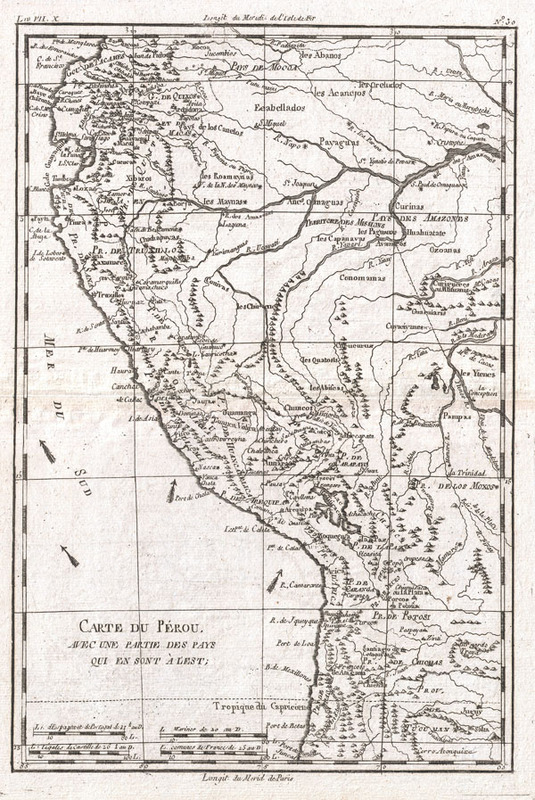 A fine example of Rigobert Bonne and Guillaume Raynal's 1780 map of Peru. Covers from the Pacific well into the Amazon and as far south as the Aconcagua Desert. Shows Tradewinds in the pacific and shows mountains in profile. A number of important indigenous villages and mission stations are noted. Highly detailed, showing towns, rivers, some topographical features, important roadways and political boundaries. Drawn by R. Bonne for G. Raynal's Atlas de Toutes les Parties Connues du Globe Terrestre, Dressé pour l'Histoire Philosophique et Politique des Établissemens et du Commerce des Européens dans les Deux Indes.